In our business of window replacement in Chicago, our window experts are adept at using the swing stage to effectively take care of our customers’ window replacement needs. Here are a few things about a swing stage that you need to know. 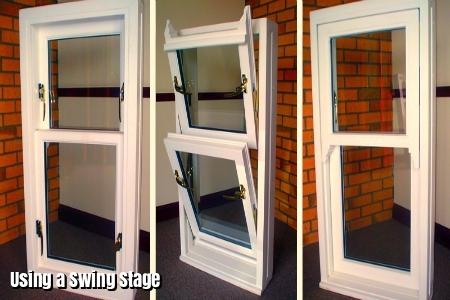 A swing stage is a suspended platform, which can be raised or lowered when carrying out tasks like window replacements, tuck-pointing, etc. It is also known as ‘suspended scaffold” or ‘suspended cradle’. The design and erection of a swing stage must be done by competent people. Erection is usually done by someone holding an advanced rigging high risk work license. Though operators do not need to have special qualifications they must be trained and experienced in handling swing stages. It is imperative that the manufacturer’s instructions be followed at all stages of the installing, erecting and operating of the swing stage. Safe exit and entry from the cradle must be provide for and teams need to be trained on the different features of the swing set so they will be equipped to deal with any malfunction or issues. A rescue and retrieval procedure needs to be put in place so the teams know what needs to be done in case of issues. 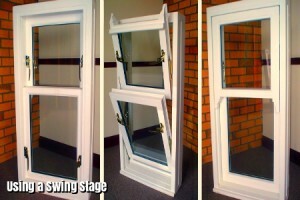 The swing stage must be examined for damages and wear and tear before using it every time. Periodic non-destructive testing needs to done on the swing stages to identify cracks and address them before they can cause damage. replacement. Contact us and find out more about why we would make a perfect choice for you.